This is the 180 to 200 lbs. swordfish I caught with my friend Jim Mulchahey. It took 1 1/2 hours on #50 lbs. stand-up tackle. We set up on another drift and within a half an hour we hooked this 100 pounder, which I caught in about a half an hour. 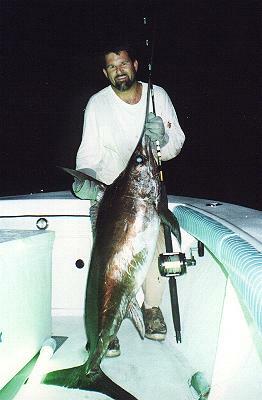 This swordfish I estimated at 100 lbs. and it weighed 98 lbs. at the dock. 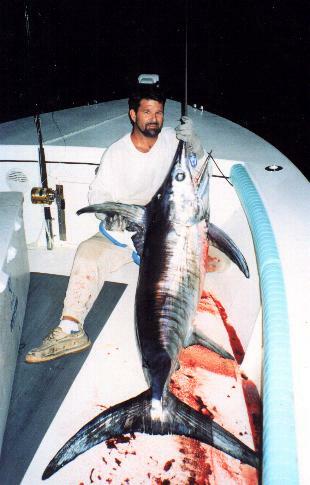 The bigger swordfish had to be "cord out" (cut the head and tail off, then gut it) so it would fit in Jim's fish box. So we feel pretty good about the other estimate of the bigger swordfish. Two swordfish flags flying from the rigger is a great half night of fishing. What a swordfish! 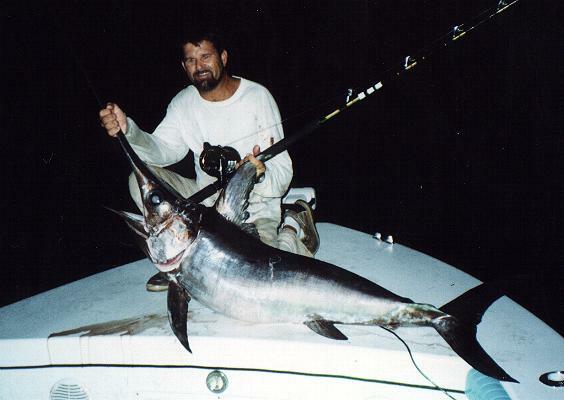 It was big, for a swordfish down in Florida , now. We estimate it was +180 lbs. 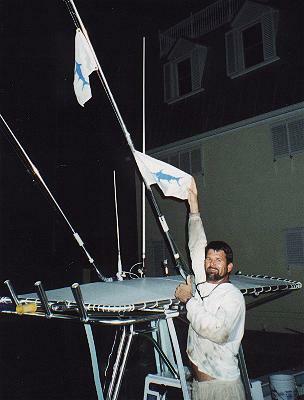 (we called the second swordfish 90 lbs. which actually weighed 98 lbs. at the dock 2 hours later). We had to core the fish out to get it in the fish box. We got some great pictures which I will post as soon as I get my software from my scanner reloaded.